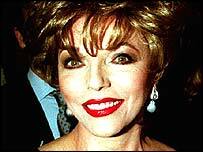 Ex-soap queen Joan Collins said she is not a supporter of the UK Independence Party - she is just a patron. The actress , who described herself as a "huge Thatcherite", threw her weight behind the party in the run-up to the European elections earlier this year. But, in an interview with the Spectator, she clarified her position. "I am not a supporter. I'm a patron [meaning] they put my name on the head of their paper but doesn't necessarily mean I'm going to vote that way." Earlier this week Robert Kilroy-Silk resigned the UKIP whip after weeks of jockeying for the leadership. Miss Collins revealed it was the ex-chatshow host who telephoned her last May to ask if she would be patron of the party - a call she said she found "extremely flattering". At the time she said: "I do feel that my country - I am English - is losing a lot of what I grew up with. I feel we are eroding ourselves to Brussels." Quizzed as to whether she was still a UKIP person today, Miss Collins responded: "What is a UKIP person?" To the suggestion it meant a supporter of the party, Miss Collins replied: "I am not a supporter. I'm a patron. "'Patron' means they put my name at the head of their paper. And it means I could be a supporter but it doesn't necessarily mean that I'm going to vote that way. I understand there have been some changes." Miss Collins said that she was not particularly political and since backing UKIP she had "got to know a bit more" about their policies which she felt were "quite reasonable". "This was four months ago and, to be quite frank, I have not been concentrating on British politics," she added. "But you know what, I really don't want to get into politics." She said: "I don't know why everyone is so fascinated with me and Ukip. I was always going on about how much I loved Maggie Thatcher. I don't remember that causing much of an outcry. "I was a huge Thatcherite and nobody seemed to give a damn, so why all of a sudden this whole thing with UKIP? It doesn't make any sense to me."